Augmented reality. Just a scene from Back To The Future Part II? The days of merging the real world with computer generated images are closer than we think. In fact, primitive versions of AR have already arrived in the form of smartphones with built-in GPS and cameras. By aiming a phone's camera at a store, you can not only see the store but also a review at your fingertips. Currently AR is primarily used as a marketing gimmick tactic extending a brand into virtual 3D webcam space. Think Robert Downey Jr. on Esquire's Augmented Reality Cover or General Electric's Smart Grid digital hologram. But what does this mixed reality mean for the future? Imagine bubbles of information right in front of your eyes, literally, embedded in contact lenses. As you walk down the street, you will see details about the nearest bus stop and schedule, area statistics, restaurants and reviews, gas station and the current price, that house for sale across the street, and your nearest Facebook friends in the area. The information all activated with your eye's retina, no longer a fingertip thing. The world with AR will become an integrated part of daily life much like Internet and email is today. National Geographic is suggesting that AR enabled contact lenses could hit the market as soon as 2015. How will the future of design be affected? User interface design will become even more critical as information overload will become even more widespread. The experience could feel very much be like walking through Times Square New York with all the billboards and news tickers. The difference in that the user will customize the data information that will be presented to them. The ability to filter our virtual reality, opting in and out will be essential to our augmented reality experiences. There will be moments where we will have to disconnect. The synthetic spaces that we create will force a streamlined data exchange. Instead of designers focusing on how product will function in the real world, there will be thought involved on how the product will extend into the virtual world. Keiichi Matsuda has an amazing video of how reality and computer generated reality could possibly merge into our daily lives. Will society feel like they are playing one big video game? Though there are numerous benefits of AR, it will be interesting to see the psychological effects on society. As with the social networking of today AR will allow users to connect with their friends, family, and people that share interests, but in an even more custom way. For many users isolation and lack of human interaction could cause their virtual reality to become their reality. With access to information as close as your retina, will society become reliant on AR for all the answers - similar to just Googling today? 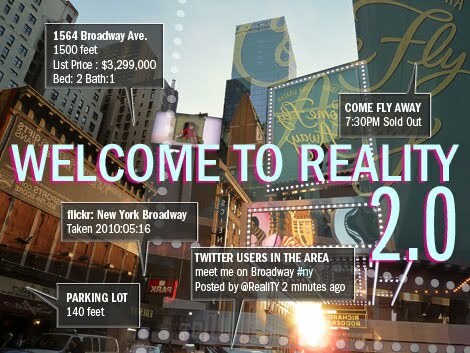 Will augmented reality become the next level in the real world - reality 2.0?